I’m deeply encouraged that Americans are out in the streets again protesting tyranny. That’s what we witnessed Friday when tens of thousands of Americans in as many as 164 cities rallied against Obamacare and its mandate to require employers to provide health insurance coverage that violate their consciences. While the Obama administration has framed this debate as opposition to “contraception,” that is the biggest deception since he promised to fix the economy in 2008. Neither should this issue be seen as one affecting only devout Catholics. As a non-Catholic employer who has no problem with contraception, I will refuse to comply with this mandate out of principle and my own personal conviction against subsidizing abortifacients. This is a religious freedom issue – pure and simple. America was founded on the principle of religious freedom. May it result in his political demise. 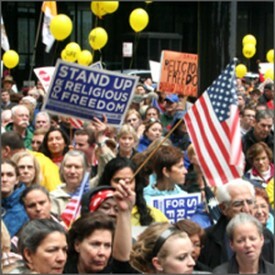 The “Stand Up for Religious Freedom” protests come as the U.S. Supreme Court is expected to make its decision this month on the constitutionality of the Obama administration’s Affordable Care Act. The rallies are a project of the Pro-Life Action League, united with 70 other organizations. The groups are demanding Obama and Health and Human Services Secretary Kathleen Sebelius withdraw mandates requiring nearly all private health insurance plans to cover the prescription contraceptive drugs and devices, surgical sterilizations and abortion-inducing drugs, such as Plan B.
It’s certainly bad enough that the federal government exceeds its constitutional authority by requiring employers to provide health insurance of any kind. It’s certainly bad enough that the federal government exceeds its constitutional authority by requiring American citizens to buy a service against their will. But mandating that all employers, regardless of their deepest religious convictions, subsidize the taking of innocent human life is, quite simply, an abomination. Lila Rose of Live Action, producers of many video exposés on the abortion chain Planned Parenthood and one of my personal heroines, disputed “war on women” propaganda used by abortionists and the Obama re-election campaign. But do 164 rallies taking place on the same day around the country make an impact if the media ignore them or treat them merely as small local events? They can if they continue – and build momentum. The mainstream media tried to bury the tea-party movement. It didn’t work. Americans are rising up and fighting for liberty, again. That’s refreshing. That’s what America is all about. In the spirit of Jefferson, James Madison, John Adams and America’s other founders, we have a duty and an obligation to resist attacks on religious freedom today without compromise and by any and all means necessary. Tea-party-style uprisings must never be constrained to economic issues. They should always be about fighting for liberty and against tyranny. This fight is not about contraception. It’s about deception and tyranny.